Lead shot is the most numerous artifact recovered from Queen Anne’s Revenge, accounting for over 50% of identified artifacts as of March 2018. Shot could be used in muskets, pistols, and blunderbusses, or bagged and fired from a cannon as anti-personnel projectiles. Two methods of manufacture are represented among the Queen Anne’s Revenge shot. 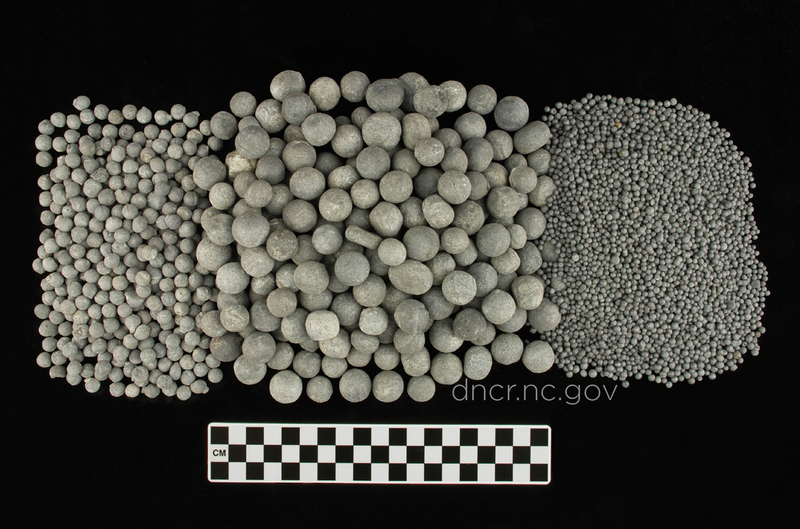 The larger shot was produced individually by pouring molten lead into a two-part bullet mold. Seam lines and a casting sprue are evident on many of the samples. The smaller Rupert shot, similar to “bird shot,” was manufactured by pouring molten lead through a brass colander that allowed lead droplets to fall about 1 foot into a container of water. This method, first publicized by Prince Rupert in 1665, is identified by slightly oval-shaped shot with small dimples in the flattened faces. The shot-tower method, capable of producing more perfectly spherical shot, did not become popular for another century.